All GHC students, faculty, and staff have access to all the University System of Georgia libraries, both in person and by remote request (aka GIL Express). 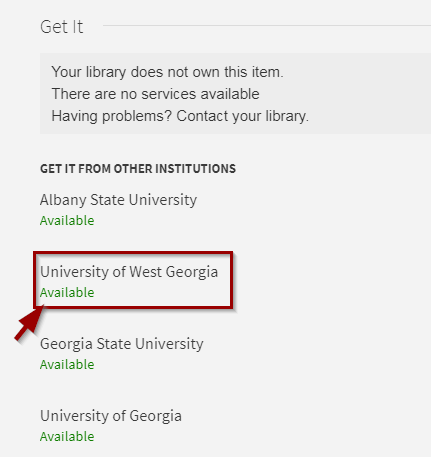 To find books at these libraries, you can search the GHC GIL Catalog and choose "University of System of Georgia" from the drop-down menu. You may check the status of your request under “My Account” by selecting the lending library (in a list by My Library Account at the top) and viewing “Requests." Books usually arrive in about a week, but that’s not guaranteed. Plan accordingly. Books automatically renew twice unless there is a hold. A single loan period is twentyeight days. Please contact the library if you have any questions or to report any problems. Go to Gil-Find, our online book catalog, and "Sign In” to your account. Use the same login information as D2L/Brightspace/E-mail. Choose “University System of Georgia” from the drop down menu by the search box. Select a library from the list (there may be more than one option) and click on “Available”.